This blog post is designed to answer some questions you may have regarding Canada’s Express Entry Immigration Program, including what the program is, who is eligible, and how one may apply to the program. What Is Canada’s Express Entry Immigration Program? Canada’s Express Entry Immigration Program was introduced in 2015. The program is simple. 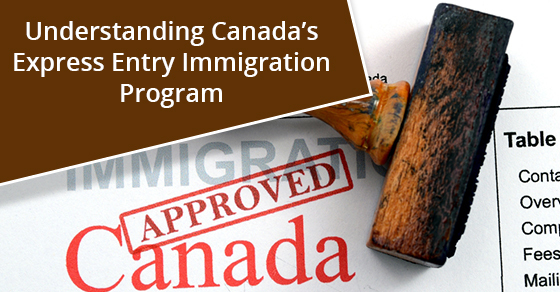 It’s designed to select the best applicants and give them the opportunity to apply for permanent residence in Canada. This program also helps candidates get an approved job offer in Canada. This program was introduced to remedy a long-standing problem in which immigrants with professional or advanced degrees would arrive in Canada, but be unable to find employment worthy of their jobs skills. In order to enter the pool, applicants must meet the eligibility requirements that pertain to the particular program that they are applying to. This would either be the Federal Skilled Worker Program, the Federal Skilled Trades Program (designed for those who have experience in a skilled trade) or the Canadian Experience Class (this is for applicants who already have experience working in Canada). You can find the specifics of the eligibility requirements online. To apply to enter the program, you must create an online express entry profile (assuming, of course, that you’re eligible to apply). After this, you will be given a reference code to apply on the Canadian job bank. Your application will remain in the pool for one year. The applicant will receive a point score based on his or her qualifications and will be ranked based on a comprehensive ranking system that’s determined by the immigration department. The maximum score you can get is 1200 points. Regardless of the program you are in, you will automatically get 600 points if you have an employment opportunity and 600 points if you’ve been nominated by a Canadian province. In fact, if you meet these two criteria, you will be able to apply for permanent residence. Every few weeks, a draw is held, and candidates with a score above that week’s cut off will be given the opportunity to apply for permanent residence. To read more about Canada’s Express Entry Immigration Program, click here. Keep in mind that immigration rules can change, so it’s important to always ensure that you are viewing the most up-to-date information. Max Berger Professional Law Corporation has been a leading Canadian full-service immigration law firm since 1987. For more information, contact us here.